This insulator combines strength, safety and appearance. 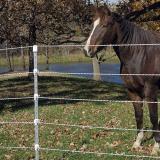 It covers the sharp-edged top of steel T posts and holds rope, braid, twine, wire and 1/2" tape. 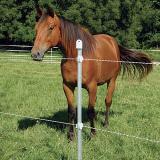 It can also be used as a cover for tops of steel T posts anywhere along fence line to help protect injury risk to livestock or horses. 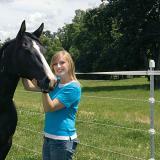 Will fit on T posts facing either way. 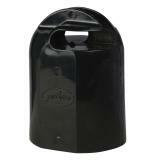 Holds rope, braid, twine, wire and 1/2" tape. 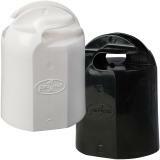 All sharp edges of the topper have been rounded to reduce the risk of injury. 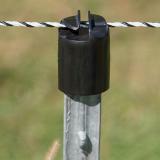 Line up the grooves on inside of insulator with top of T post. Tap the insulator down into place. If using a conductor, thread conductor through hole. 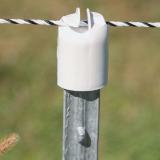 Excellent T post top insulator, takes a bit maneuvering at first to figure out how they fit once figured out its easy, hot wire easy to install, these are used in our horse pasture on a newly installed field fence. 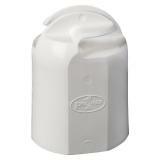 This is the best t-post top insulator. Very good durability. Extremely easy to install and work with.